But Vaclav Klaus, president of the Czech Republic, may be relishing his country's assumption of EU leadership in January for very different reasons - as an opportunity to publicise views which other EU leaders will not enjoy hearing. Mr Klaus gave a foretaste of what the EU can expect on an official visit to Ireland in November. Upsetting his Irish hosts, he ostentatiously visited Declan Ganley, leader of the successful Irish No campaign against ratification of the EU's Lisbon reform treaty. Klaus compared Ganley and his supporters to dissidents in the old communist bloc - which angered many former Czech dissidents who suffered persecution and imprisonment for their views. He was born in Prague in 1941 during the wartime Nazi occupation. As an economics student in post-war communist Czechoslovakia, he was allowed to study in Italy and the United States during the political thaw of the mid-to-late 1960s. But the Soviet-led invasion of Czechoslovakia in 1968 ended all hope of wider international opportunities for bright young Czechs. Klaus, who refused to join the Communist Party, could not aspire to a senior academic or business job. But he was allowed to earn his living in the 1970s and 80s in a post at the Czechoslovak National Bank. He did not join the more open campaign of opposition to the communist regime led, among others, by the playwright Vaclav Havel. But as political restraints eased again in the late 1980s Klaus did organise seminars to discuss free-market economics. He was always supremely self-confident or, as his critics put it, arrogant. According to files published last year in the Czech press, a communist secret policeman sent to monitor Klaus's seminars concluded that "he feels like an unappreciated genius". 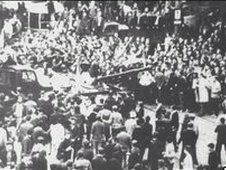 But then, in late 1989, the chance to be appreciated dramatically appeared as Communist rule collapsed. Klaus turned up at the Magic Lantern theatre, headquarters of the Civic Forum opposition, led by Havel. His economic expertise, good command of English and ability to handle the international media won him rapid advancement. But he remained very different from Havel and those closest to him. While the latter dressed informally, and liked to discuss politics philosophically over beer and cigarettes, Klaus wore blazers and ties, consumed raw vegetables and mineral water and lectured all and sundry on economic theory. He built his political career in the early 1990s as a finance minister promoting rapid free-market reforms, founding and leading a conservative Civic Democratic party modelled partly on the British Tories. 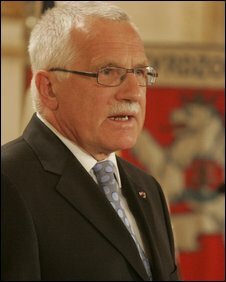 Margaret Thatcher was a political and economic inspiration for Vaclav Klaus. 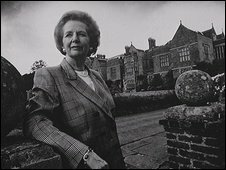 Pictures of Margaret Thatcher featured prominently in his publicity material. 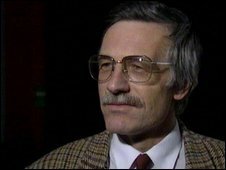 In 1992, after their parties did well in federal elections, Klaus and the Slovak leader Vladimir Meciar controversially negotiated the splitting of Czechoslovakia into two independent states, without a referendum. Klaus became prime minister of the Czech Republic. But he became an increasingly frustrated figure as Czech politics became bogged down in stalemate, with parties of the Left remaining much more influential than Klaus had hoped. There were also corruption allegations surrounding the privatisation programmes he had introduced and the financing of his political party. Klaus resigned as prime minister in 1997, but managed to secure election as Czech president in 2003, in succession to Vaclav Havel. Their feuding was constant. Klaus called Havel elitist - "I am a normal person, he is not," he said. Havel has said of Klaus that he only has two ways of behaving: "Either he's afraid of someone. Or he's out to humiliate him." As president, Klaus has had less executive power, but has felt freer to air his opinions, especially towards the EU. "Whenever I look at the Berlaymont building (European Commission HQ) in Brussels," he once told the British politician Norman Lamont, "I seem to see the word Comecon" - a reference to the old Soviet-dominated communist trading organisation. While some Czechs applaud this kind of view, opinion polls suggest a majority remain much more positive about the EU. The list of Klaus's running battles with international orthodoxy grows ever longer. He recently refused to join Western condemnation of Russian policy over Georgia and he challenges international environmental policy. His book disputing that man-made climate change is happening is entitled Blue Planet in Green Chains. But Vaclav Klaus is unlikely to let the opportunity pass to snipe at what he once called "business class Eurocrats" lording it over "economy class Slavs", as this most combative of Czechs condemns the error of Europe's ways. Chris Bowlby's Profile of Vaclav Klaus was first broadcast on Saturday, 27 December at 1900 GMT on BBC Radio 4 . It was repeated on Sunday, 28 December at 05.45 GMT and 17.40 GMT. Listen live or catch up on the BBC iPlayer or subscribe to the podcast .